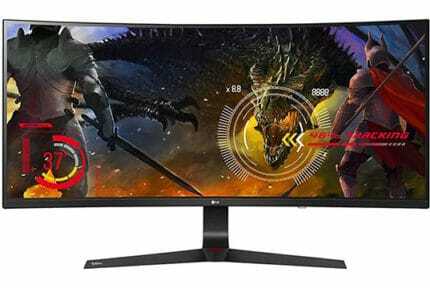 The LG 32GK850G is a 32″ 1440p 144Hz G-SYNC gaming monitor. 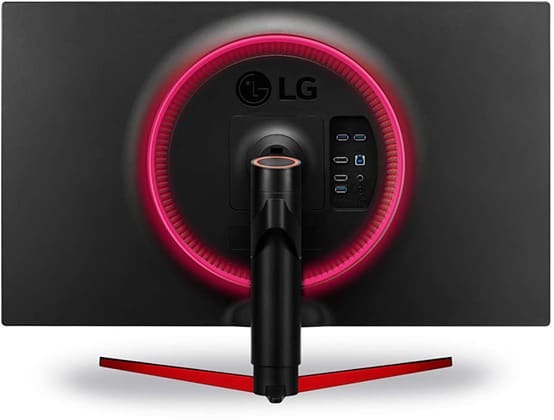 Although there are numerous displays with similar specs available, the LG 32GK850G differentiates by having a flat screen and a unique and innovative RGB lighting technology. In this review, we’ll see how it compares to its alternatives and whether it’s worth the extra cost. 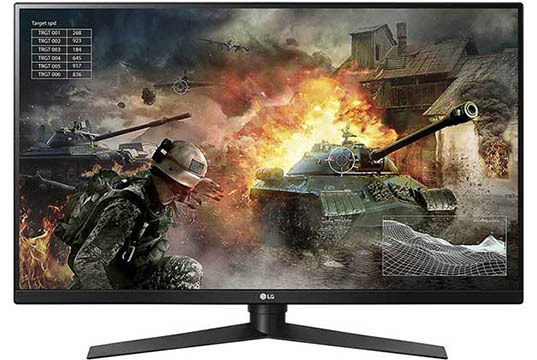 Based on an AMVA (VA) panel by AU Optronics with a static contrast ratio of 3,000:1, a peak luminance of 350-nits, and true 8-bit color depth with the standard sRGB color gamut coverage, the LG 32GK850G offers quite an immersive image quality. The colors are not as accurate and consistent as they are on IPS panels, but they are vibrant and bright. Further, thanks to the superior contrast ratio of VA panels, the darker shades are more vivid which makes for more pronounced details and an overall better relation between the darkest and the brightest colors. Such high contrast ratio in combination with the absence of IPS glow makes for a very enjoyable viewing experience, especially in dim-lit rooms. The viewing angles are 178° both horizontally and vertically, so there are no prominent shifts in color, contrast, or brightness when looking at the screen from skewed angles. 1440p resolution (2560×1440) results in a decent pixel-per-inch ratio even on the large 31.5″ screen of the LG 32GK850G monitor. With roughly 93 pixels per inch, you get the same pixel density as that of a 24″ 1080p display, but on a huge 32″ screen. Just like most modern monitors, the LG 32GK850G G-SYNC display has a flicker-free backlight and an integrated low-blue light filter. The LG 32GK850G input lag amounts to only ~4ms of delay which is virtually imperceptible. Turning to the response time speed of 5ms (GtG), there is some trailing visible in fast-paced games, more so when dark pixels are predominant in the picture, which is expected from a VA panel display. There are four response time overdrive settings (Off, Normal, Fast, Faster). The ‘Faster’ preset introduces some overshoot but it also eliminates most of ghosting, so it’s more or less viable, depending on your preference. Moving on, in the OSD (On-Screen Display) menu, you can overclock the monitor up to 165Hz. G-SYNC works all the way up to 165Hz (30Hz-165Hz) and it can function at the same time as the ‘Faster’ response time option which is standard for G-SYNC monitors, but a rarity for FreeSync models. Overall, with G-SYNC enabled, Response Time set at ‘Faster’, and 165Hz overclock, the gaming experience is stunning; Though there is visible ghosting, it’s tolerable and the high contrast ratio of VA panels more than makes up for it. Underneath the bottom bezel of the monitor, you will find the OSD joystick as well as a little scroll which is used for adjusting the Sphere Lighting RGB technology. Sphere Lightning consists of LEDs which are placed at the back of the monitor and form a shape of a ring/circle. The LEDs can get quite bright, so you will be able to see the lights reflecting off of the wall when facing the monitor normally and get atmospheric ambient lighting. It can even glow while the monitor is powered off. To turn on/off this feature, press and hold the scroll. Just pressing it toggles different glowing styles (color cycle, rainbow, red, green, cyan, magenta, and White Daylight) and rolling it to the left/right adjusts the intensity of luminance. Other features include Black Stabilizer (for better visibility of objects in the dark), Crosshair (custom crosshair overlays), and pre-calibrated picture presets (Gamer 1, Gamer 2, FPS 1, FPS 2, RTS, and Reader). Other important adjustments include brightness/contrast, gamma, color temperature, and input source selection. You can adjust all of these settings in the OSD menu via the joystick or in the On-Screen Control desktop application. 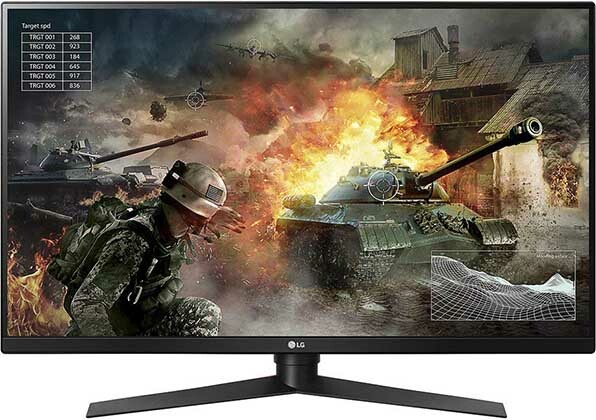 The LG 32GK850G 1440p gaming monitor has a sturdy design with slim bezels and an ergonomic stand (110mm height adjustment, +/- 20° swivel, -5°/15° tilt, 90° pivot, 100x100mm VESA mount). Connectivity options include one DisplayPort 1.2 port, one HDMI 1.4 port (max 60Hz at 1440p), a dual-USB 3.0 hub (one upstream plus two downstream ports), and a headphones jack. The screen has a light matte anti-glare coating which eliminates sunlight reflections but preserves the image quality. The LG 32GK850G price is around $650 which is a bit steep considering that the LG 32GK650F is available for around $400. For around $600, you can get the LG 32GK650G which is same as the 850G model, but without the Sphere Lighting RGB technology. The LG 32GK650F is based on the same panel (same contrast, brightness, and color gamut) but it has FreeSync instead of G-SYNC. It also doesn’t have Sphere Lighting nor a 165Hz overclockable refresh rate (native 144Hz max). Furthermore, as we’ve already mentioned, most FreeSync monitors cannot use FreeSync and aggressive overdrive simultaneously, so the LG 32GK850G will have less ghosting at higher frame rates. However, the LG 32GK650G also features a motion blur reduction technology which via backlight strobing eliminates trailing, but at cost of maximum screen brightness. Finally, there’s the LG 32GK850F which has FreeSync 2 and entry-level HDR support (VESA DisplayHDR 400). It goes for around $600. All of these LG models are based on the same flat VA panel, or a slight derivation of it. If you’re interested in a 32″ 1440p 144Hz curved VA panel, check out the AOC CQ32G1 and the AOPEN 32HC1QUR. All in all, the LG 32GK850G offers a remarkable gaming and viewing experience. However, we find the LG 32GK650F to offer better value for the money considering that FreeSync works with compatible NVIDIA cards. It may not have fancy RGB lighting nor variable overdrive, but if you’re sensitive to ghosting and motion blur, its backlight strobing technology will be of great use while the 144Hz/165Hz difference is subtle and even unnoticeable to most gamers. The 650F will provide you with the identical image quality and almost as good performance as the 850G/650G. The $200-$250 difference would be better spent on a PC component upgrade. You may be tempted to get the GK850F model with HDR, but since it’s only entry-level HDR with a 400-nit peak brightness and ~95% DCI-P3 color gamut upgrade, we don’t think it’s worth extra $200. 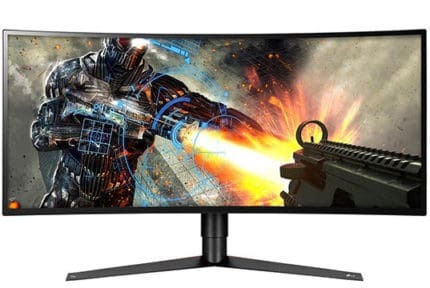 If you want a 32″ 1440p 144Hz VA gaming monitor with HDR, check out the Samsung C32HG70 with quantum dots and HDR600. The LG 32GK850G offers a stunning image quality with an exceptionally good performance for VA panel. It also has a bunch of useful features including G-SYNC and Sphere Lighting which add a premium on the price thus making the LG 32GK650F model much more appealing price/value-wise.